Schnauzer mixes adore the Venison Entree Sausage from Jones Natural Chews. The Venison Entree Sausage is a hard treat, crunchy and easy to snap into small pieces. 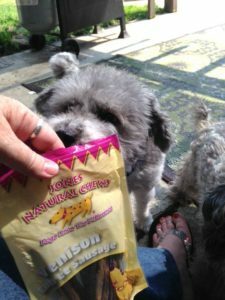 The perfect treat for dogs of all sizes, it’s all natural and 100% grown and made in the USA. Take a quick peek at your dog and tell me if it’s drooling. Here’s what Jones Natural Chews has to say about their Venison Entree Sausage. 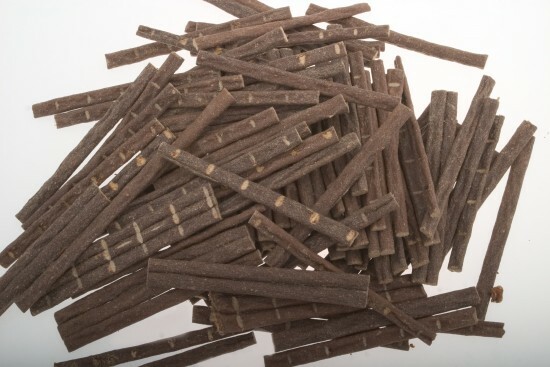 With Venison Entree Sausage your dog will be running toward you for that treat, sitting down being a good dog waiting for this chew, and will be chewing the venison instead of your shoes. This jerky is USA venison (deer) that is oven baked with only two natural ingredients added. The ingredients in Venison Entree Sausage are venison, rye flour and salt. Simple and delicious. Don’t believe me? Let’s ask Lucy and Dixie. 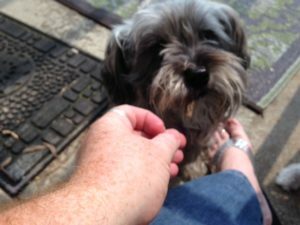 Lucy is a Schnauzer stray who wound up living with my friend and her Schnauzer mixes. She’s my new best friend. Venison Entree Sausage is her new favorite treat. Naturally. See how it makes her smile? And now let’s ask Dixie. Dixie is an old Schnauzer mix and is trying the Venison Entree Sausage for the first time. She’s decided that she loves it and wants to marry it. Unfortunately, that’s illegal in 13 states, including Oklahoma. Too bad, Dixie. You’ll have to settle for eating half a bag instead. I’m sitting here trying to think of arbitrary rules, but can’t come up with any – just enter already, okay? 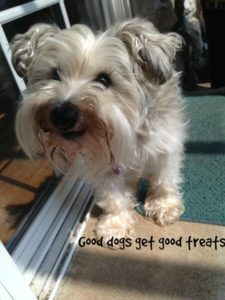 I do feel the need to reiterate some tried and true guidelines for dogs and treats. Now enter! And tell your friends, please! I’d love to see everyone sharing this link. And liking the Jones Facebook page. And following us on Twitter @JonesChews. Naturally!